Fishing out of the Los Suenos Marina has been a little slower the past week but seems to be improving. The group on the 42 Maverick caught another marlin early in the morning, 30 minutes after getting the lines out, but the rest of the day was slow. They were 1 for 2 on sailfish. They also heard about a few boats that got skunked. Sarah went our for a ½ day and caught a Mahi, 2 Yellow fins, and a Benito. A group went out on the newest 42’ Custom Maverick bottom fishing and filled the boat with Pargo, Tile fish, and Grouper. Thanks to Colt and Karen for sending in a report with pics from their trip. We always appreciate these! Please everyone keep them coming. “We had a great trip. It rained off and on but that didn’t seem to bother the fish, We caught 4 yellow fin tuna and 3 blue marlin. and could have caught more but my arms couldn’t even hold the pole after the last marlin, It was the ultimate fishing trip!!! A group of 4 started out 7am south of the corner but the bite was slow in the morning so they ended up running out another 20 miles. Thirty minutes after putting out the lines they had a huge marlin on their teasers. Not bad for the 1st fish of the day. After fighting the marlin for about an hour the captain saw a bird party and started to head that direction. As they got closer they noticed there was also a huge school of Porpoise. They had the live bait rigged up and the tuna plug out but the tuna only wanted a ballyhoo. On the way in they caught another 3 sailfish for a grand slam! The bite is back on. This group will be back out Sunday and will report back. tons of fish both days. We would ask to catch a Marlin and we got two, as for Mahi caught two huge ones, looked for tuna got 9. We got other fish too, but I won’t bore you. The 3rd Annual Los Sueños Marlin Invitational took place December 1‐4, 2010 and wrapped up on Saturday, December 4th with a delicious meal and awards celebration at El Galeon Restaurant in Los Sueños Resort and Marina. 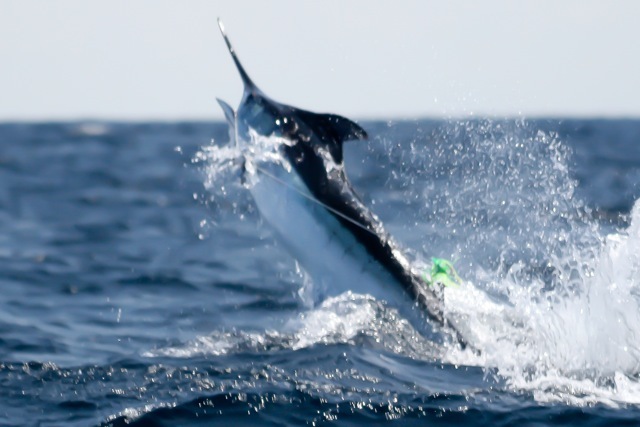 Everyone following the tournament action over the three days of fishing agreed that the marlin bite was off the charts, with 77 of the 111 billfish caught by the 43 anglers fishing on 12 boats being marlin. It has been said around the docks that the boats saw at least 3 times that number! Looking out on the horizon the morning of Day 1 was a bit foreboding, but the weather turned around before noon and the bite shot off. 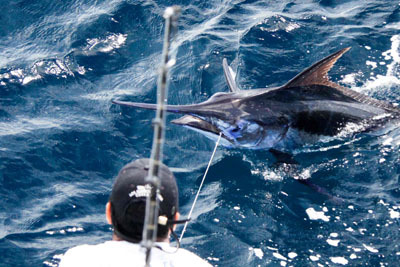 By the end of the day 33 billfish had been released, 24 of which were marlin and 9 sails. Big Oh headed the leader board with 4 marlin and 1 sail, followed by Uno Mas who released 4 marlin, and Miss Behavin trailed in third place with 3 marlin and 1 sail. By the end of Day 2 Sea Angel had taken a substantial lead, scoring 5,200 points that day alone after releasing 5 marlin and 2 sails. However, the win was still up for grabs as Big Oh finished just 1,100 points behind in the two‐day combined standings after releasing 3 marlin for the day. It was only 1 marlin and 1 sailfish separating these two going into Day 3. The Big Oh and Sea Angel were in the zone throughout the tournament, but even more so on the last day of competition. They kept going back and forth in the standings, The Big Oh in first for an hour, then Sea Angel, and so on. Sea Angel caught their last marlin at 2:27 pm, exactly 1 hour ‐ to the minute ‐before Big Oh caught their last marlin to take the win. 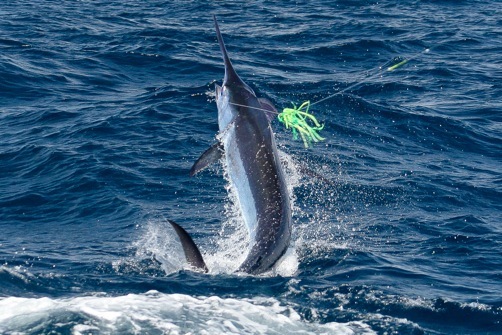 Big Oh ended up releasing a three‐day total of 11 marlin and 5 sails, totaling 11,500 points. Sea Angel came in a close second with 10,600 points after releasing 10 marlin and 6 sails. Family and Friends took third with 7 marlin and 3 sailfish releases for a total of 7,300 points. Nearly 120 people gathered at El Galeon Restaurant Saturday evening to celebrate the remarkable accomplishment of the winning teams and see them receive a combined cash total of $80,000. Entries for the 2011 tournament series (January 26‐29 and March 2‐5) are being accepted via the official series website, www.LStournaments.com. For further information, please contact Ashley Bretecher, Tournament Director, toll‐free 1‐866‐865‐9759, Direct: 011.506.2630.4005 or e‐mail a.bretecher@lsrm.com. Information on Los Sueños Resort and Marina is available online at www.lsrm.com. LET’S START NORTH AND WORK OUR WAY SOUTH. Capt. Lee in Tamarindo says that water temp has been in the low 80’s, and the Marlin bite has been pretty consistent for the past week or so. 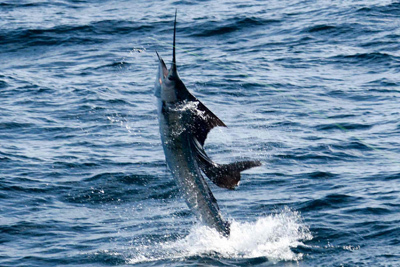 Several boats report raising and releasing multiple billfish per trip. 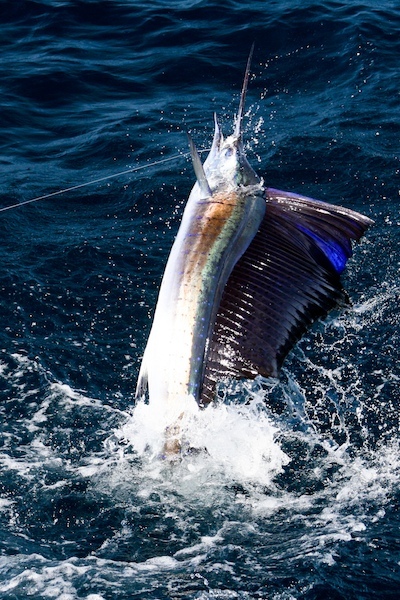 Blue and Striped marlin have provide the majority of the action along with Sailfish and a very scattered Dorado bite. Sea states have been variable; some days are slick calm, other days we run South to find calmer waters. All in all, the fishing is very consistent! Petra in Tamarindo let’s us know that Salsa has had action with grouper and roosterfish, and thee Talking Fish caught a nice wahoo and a dorado on a half day. Fishing out of the Los Suenos Marina yesterday a 10 year old boy who weighs 60 pounds caught a 59 pound snapper, it was caught at 26’s. Thanks Laura. Let’s go about as far south as you can go, in Golfito, some friends living in La Cuesta spent a day offshore/inshore last Sunday, and had a more than memorable day. One guy went and bought an outdoor grill after the trip ! They were approx. 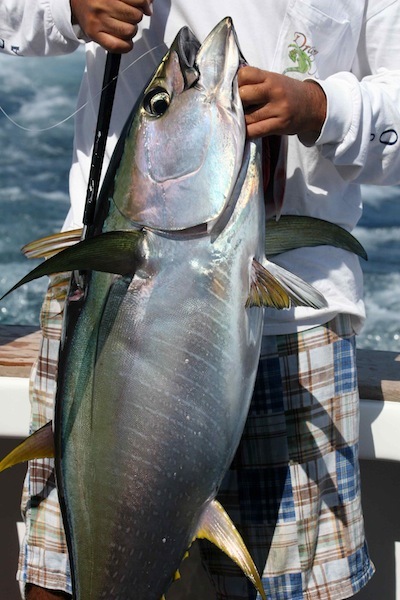 only 6 miles off Punta Banco( Pavones), and they trolled rapalas and a few plastics that were slammed repeatedly by dorado, big ones, and then they got into a few birds, and the yellow fin tuna , up to 50 lbs., could not be kept off the lines. Alonzo Paniagua, local expert mechanic, said it was one of the best times he’s had in a boat. His wife was in the house when he said it. The boys then went back inside, as they had a lot of fish that needed attention, but stopped at a spot where there were a few rocks. There they caught 3 respectable snappers with their 5 live sardinas, and it was time to head in and purchase extra large Zip-Lock freezer bags. The 4th Annual Tamarindo / Flamingo Raft-Up is an all day beach party event that takes place at Playa Minas Dec 12, 2010. Participants are able to drive to the event or hop aboard one of the many boats departing Tamarindo or Flamingo bay. Upon arrival party-goers are met with a fully catered BBQ, music by The Leatherbacks, games, beverages, and plenty of good times. Don’t miss out on one of the areas best shindigs! Proceeds from the event benefit several local charities as well as local law enforcement, The Surf Rider Foundation, beach clean-up, and The Tamarindo Nautical Assoc. Tickets can be purchased in Tamarindo from La Paz School (2654-4532) and Marie’s Restaurant. Boats leave at 9:00am, party ends at sunset! 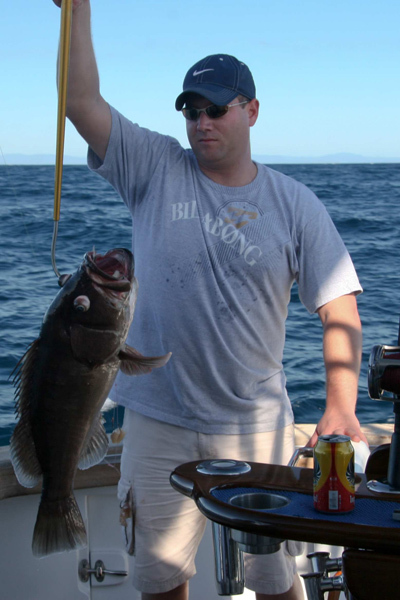 You are currently browsing the Costa Rica Fishing Reports blog archives for December, 2010.